Salmon refer to a fish species that belongs in the Salmoniadae family. They are quite easily confused with trout which also belong to the same family but, they have distinct differences. Salmon can thrive in both fresh and salty water. They are anadromous which means the fish have the ability of migrating upriver from the sea with the purpose of spawning. The fish hatches its eggs in freshwater and after the eggs hatch, the fingerlings travel to the sea where they get to grow and only return up river to spawn. As a result, they are one of the most popular game fish in the world in addition to being the most commonly consumed fish. 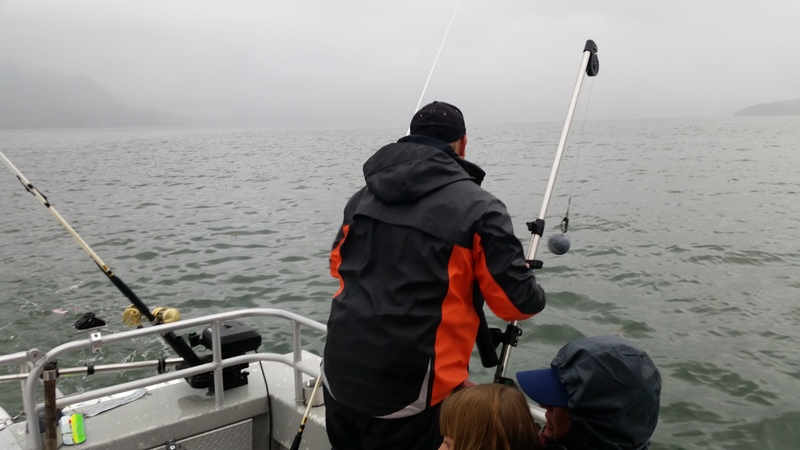 Due to its popularity, it is important to have the skills and learn how to fish for salmon. There are two common methods used for fishing salmon. Mooching is a popular method that involves salmon angling but today; it is slowly being lost among modern anglers. The reason why this method is popular is because the gear in use is simple plus anglers enjoy the peace and quiet of fishing without the need of a motor. One thing you need to note is that it requires dedication and many years of practice to learn the technique. The majority of moochers are accustomed to using a light banana shaped weight or a plug-cut herring which spins as it rises and falls. It is common for the plug-cut herring to be cut with a bevel from front to back or even side to side. This is another popular drift fishing method where anglers use a fish shaped lead jig that is moved up or down with sweeps of their rods. It is common for anglers to prefer a short and stiffer rod for example one that measures 7 ½ feet usually rated for 4 to 6-ounce lures. Anglers incorporate a direct drive level wind reel and lines that has a little stretch allowing one to experience every little tap on the jig. The good thing about this method is that it can be used either vertically or horizontally. To fish vertically, it is wise to let the line out to the desired depth. The line should be raised and lowered continuously. Furthermore, one can vary speed and distance with every 4 to 5 jigging motions. For horizontal fishing, start by casting the jig and sinking it to the depth you want. The further it sinks, the better the results. Proceed by pulling the rod towards you which will cause the jig to rise. Continue pushing away and reel until you retrieve the jig. Equipment used for fly fishing includes steamer type flies that range between 2 to 5 inches in length. There are anglers who prefer weighted flies that have dumbbell eyes. This is because they help to increase effectiveness of the fly. With this fishing method, floating and fast sinking lines are commonly used. This depends on the feeding depth of the fish. With this type of fishing, the same banana weight used in drift mooching is also used. It is common for anglers to alternate their motor in and out of gear. This is done to change depth and speed. Furthermore, it helps to provide a different action to the bait. As the simplest form of trolling, many anglers cherish it especially those who want to minimize the amount of gear needed. One thing you need to know is that any type of rod or reel will work with trolling. What you need to ensure is that it is matched to the weight you are using. It is common for anglers to prefer 6’ heavy fiberglass rods while others prefer lighter graphite rods. If you are trolling close to the surface, use 1 to 2 ounce sinkers and if you are trolling deeper, use 3 to 8 ounce sinkers. Here, anglers are required to use a stout rod with a heavy line and diving mechanism. The diver takes the lure to a specified depth which may be around 100’. If the fish strikes, the diver will be triggered and stop diving. The good thing is that the diver does not pull as hard as you may think. Furthermore, you don’t have to fight it and the fish at the same time. With this method, users will prefer 30 to 50 pound line and heavy fiberglass rods that are short. A quality level wind reel is also advisable. Downriggers consist of a large reel and boom with a wire line used to lower heavy lead balls to a specific depth. Users have access to both manual and electric downriggers. To complete the setup, a release mechanism is used which is attached to the fishing line and lead. It helps to release the fishing line when the fish has been hooked. This allows the angler to fight the fish without the need for heavy weights or divers. Now that you have learned how to fish salmon, it’s time to equip yourself with the right tools and get ready to reap huge benefits. Not only is the exercise a great experience but it takes your mind away from the hustle and bustle of city life. How to Fish for Trout Five of the Best Fish Bait Types for Catching Grouper How to Fish for Bass How to Fish For Grouper?